Automated traffic control system (KOMKON ASUDD) is a modern instrument for control and managment of the city’s traffic lights network. KOMKON ASUDD is developed on the modular basis, which allows to configure the system for specific needs of the different cities, to extend the functionality according to the needs, keeping the highest stability of operation. system data visualisation with user-friendly and comfortable GUI, that could be configured for particular user needs. The system allows to control intersections by their daily programs, which can differ from the programs that are programmed in the controller. The number of such programms is not limited. This way you can avoid the visits to the intersection for changing of phases duration for old controllers. The coordinated control omde allows to implement the “Green wave” according to coordination plans, with unlimited number of different operation programms and transition between them. For enabling the coordinated control several consequential intersections should be joined into a route. If the different coordination plans is intended for different parts of the route, the rout can be split into the subgroups. Supervisor control allows to perform operative adjustment of a traffic controller work mode and to switch it into different special modes. It is supported switching into “Yellow flashing”, signal heads black out, red to all, phase setting, daily program setting. Operator is also able to set and read the date-time in a traffic controller, to reboot it, to get the data about the failures. Supervisor control can affect as a single controller, as a group of controllers. “Green wave” functionality is implemented. Operator can arrange the passage of the special transport along predefined routes, which includes the sequence of the intersection with the phase to switch during the passage for the each controller. Also operator can provide the passage of the special transport by direct switching of the phases on the traffic light objects, which is used for undefined routes or in case of unexpexted changes. Control of the output channels state provides an information about possible faults of the traffic controller or peripheral failures: signal heads burn outs, channels failures, conflict in directions, detectors errors and so on. Also operator is immediatly warned about traffic controller door opening. Controlled intersections are visualized on the scalable city map, automaticaly dowloaded from the Internet. The constant logging of the system and controllers operation, operators’ actions is performed. Operational log supports filtering and reports printing. IP-networks (twisted pair, fiber, WiFi, WiMax). KOMKON ASUDD system provides to customer scalability and further functionality enchancments possibilities. 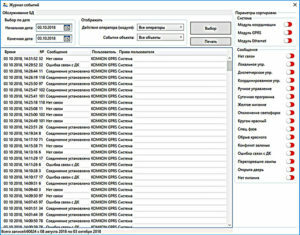 ASUDD includes import master from the controller data preparation software KOMKON SPOD. There are no software limits for maximum number of controlled intersection. The systems also supports old controllers via START protocol using KOMKON Transcoder. 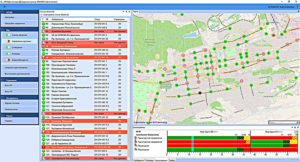 In the year 2013 the new updated version of the system was released, based on the modern SW technologies. New version brings maximum stability and wide possibilities for new functions adding.